Last week, Brooklyn mourned the sad news about Williamsburg's beloved venue, Glasslands closing down and putting on their last show on New Year's Eve. The media and public speculated whether this closure was due to VICE taking over the space and moving their offices to South 2nd Street and Kent Ave. Now another tenant from the building, a circus school The Muse has announced that they were leaving the space and moving to Bushwick. "A few months ago Angela [Buccini] was notified that the Muse’s lease would not be renewed and soon found out that Vice Magazine would be taking over the entire building – also displacing other tenants such as beloved venue Glasslands. Rather than permanently close, the Muse will relocate and rebuild," emailed us The Muse yesterday. The owner, Angela Buccinni rented a raw space in Williamsburg four years ago, and "with the help of many eager volunteers, transformed it into the home of a vibrant and welcoming community," said Angela. The Muse has been fostering the collaboration between circus, music, dance and performance art as well as providing affordable space for artists. Their goal has been to create a safe, non-judgmental, dynamic environment for circus for professionals and novices alike. The new space off Wilson L train stop. "After an extensive search process, The Muse has found a perfect new space in Bushwick, off of the Wilson stop on the L train," said Angela. The new Muse should be commanding 7,000 square feet of floor space and 30 foot ceilings, which would make The Muse the largest independent performance venue and training space in Brooklyn. UPDATE: Another, internationally acclaimed circus, Hybrid Movement Company occupies Studio D at the same building at 338 Moffat St for over 2, in which they have a 2,500 sq ft facility. 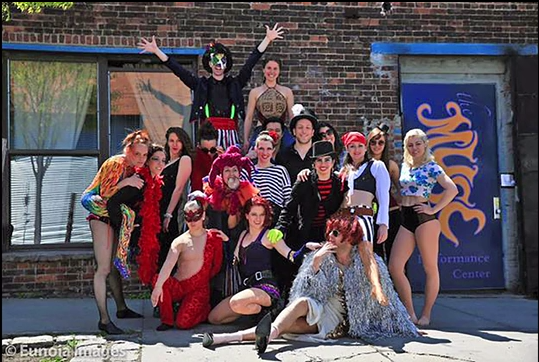 So Bushwick is officially becoming an important circus mecca, friends! In order to fund their move to Bushwick, The Muse has prepared a Kickstarter campaign with the goal of $60,000. 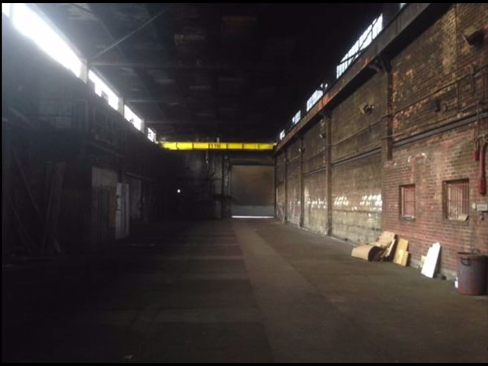 The rewards for backers include private fire eating lessons as well as the space rentals. After House of Yes, another circus venue and a school very successfully funded their new space in Bushwick through Kickstarter, our hopes for The Muse are high. So back them up, Bushwick, and circus will come!